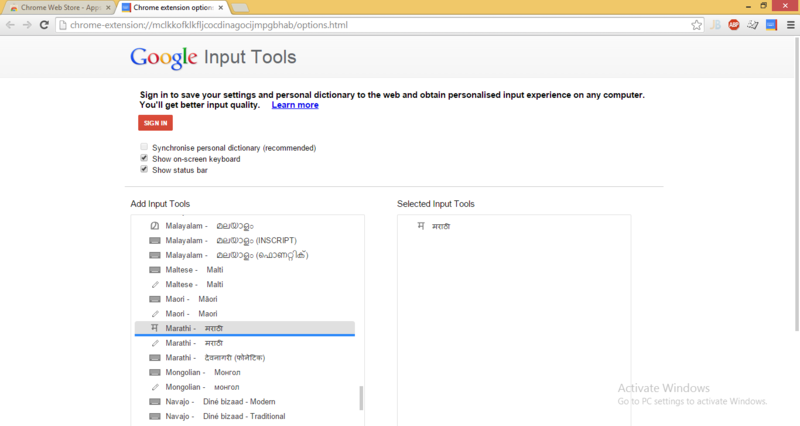 Google Input Tools a Chrome Extension will allow you to write in your language on any of the web page. This extension provides various input tools which can be used in any text box, on any website. Included tools offer transliteration, virtual keyboards, and IMEs. The extension supports all transliteration methods provided by the Google Transliteration Service (http://www.google.com/transliterate) and all keyboard layouts provided by Google Virtual Keyboard (90+ keyboards). Just Download the extension by following Google Input Tool:Chrome Extension link. When you first install the extension you will need to select the input methods you would like to use. Click on the extension icon, then select “Extension Options” in the pop-up menu. A new tab will appear where you can select your preferred input methods. You can always return to this options page to add, remove, or modify the order of your input tools. 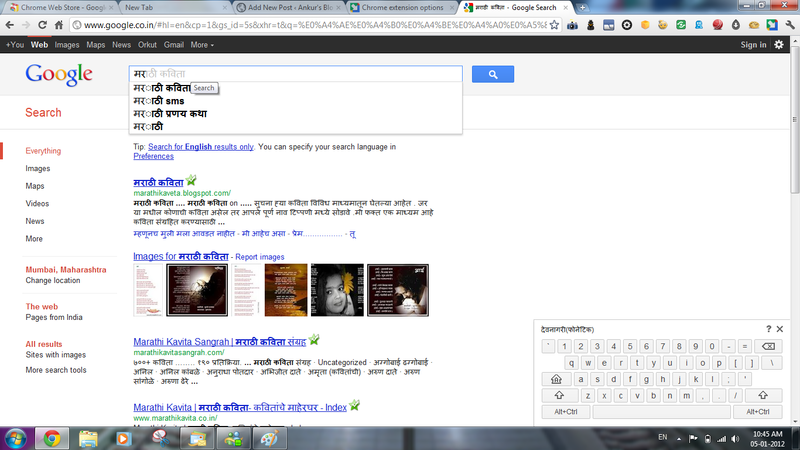 Here in following screenshot you can see that I have selected Marathi from Add Input tools. since here I have selected Marathi, options are like this. Here you can see two different icons. If you click on keyboard icon a keyboard will come up on your screen. You can use that keyboard for input purpose also. 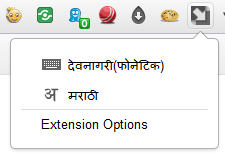 The second icon is made up of a letter from your language, here in this case you can see अ from Marathi. Clicking on this icon will enable Marathi input. In short, select the desired input tool in the pop-up menu, then click on any text box on the web page. To turn off an input tool, click on the extension icon and select the “Turn Off” option. Due to security features of Google Chrome, the Google Input Tools extension will not assist with input in the address bar (omnibox), on the Chrome Web Store site, or inside of other Chrome extensions. It also does not currently support input inside of Flash applications. If you have any problem while installing or using this tool, you can start discussion here or you can contact me directly. I am always their to help you. certificates are not valid yet!!!!!!!!!!!! Is it possible to create my own input keyboard and add to google input tool?